what a ridiculous thing to say= if they don't say anything then how the **** do you know they've seen these strange things so many many times!? what a ridiculous thing to say= if they don't say anything then how the Fk do you know they've seen these strange things so many many times!? Niels Lesniewski, who wrote the article, should not have included that quote from Harry Reid? "Reid, who has previously spoken out about the Pentagon's secretive $22M UFO program, remains committed to the notion that unidentified arial phenomena should be taken more seriously." $22 million, on WHAT?? Cripes, as we all know, Project Bluebook proved that there is no such thing as flying saucers flown by little green men. Preposterous! Just because there is an investigation doesn't mean there's something there to find...you of all people should know this. It seems clear enough that Mr. Reid means that while some pilots mention UFO sightings to someone, many more would report them officially if they were encouraged to do so rather than ridiculed. Designating someone in Congress to be their sounding board is an interesting idea. Reid was the guy who got the $22M to his buddy in Nevada. I imagine Reid supports the programs he insisted should get cash. No but it does mean that congress thinks it is *possible* there is something there worth looking into. again, this contradicts the Project Bluebook findings. This does not contradict the findings. This is one person, not congress as a whole. The R in Reid actually stands for Reptilian. Let's face it - despite the advances in aircraft systems, the best we get nowadays is the absolute drivel coming from moronic organisations like 'To The Stars'?, where they can't even get the videos attached to the right stories, and don't know how IR/gymbal camera tracking systems operate? Instead of whining, why don't the UFO=whatever proponents just provide ONE decent well-documented case? How the term, Conspiracy Theory was coined. ChrLzs. 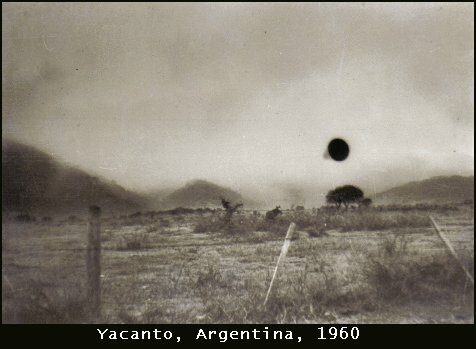 Have you ever seen the photo of the UFO taken by Argentine air force captain, Hugo Niotti in 1960, if you have, what's your opinion on it, if not, it's worth taking a look to see if you can come up with some explanation that might just solve the mystery. Or a craft from another galaxy. I think Harry wants to give him rich buddy another $22M. Do you think that will bring to light the alien metal in the warehouse? You are right. It might be an electromagnetic timeslip worm hole continuum. are you referring to the tinfoil type material that couldn't be drilled, burnt or even creased yet somehow managed to brake into small pieces on impact? OK, to be specific - here's the Hugo Niotti image, from UFO Casebook. - motion - the blur seems to have no directionality. As for the ludicrous claim as 'authentic' by some Argentinian analysis bureau, I've seen the work those sort of bureaus have done (just ask Leslie Keane). And the authenticity is only verifiable if the negative exists, and you cannot determine from such an image whether some sort of fakery was involved. It could be as simple as a button stuck on a side window of his car... An authentic button, of course!! The problem here is that we have no evidence other than a (poor) photo (and a photo which strongly suggest that the object, if it was in the original scene, was in fact not over that paddock but very close to the lens) and a (conflicting) story. It could be anything from a deliberate fake to a 15 minute of fame claim, to a false memory that he developed, mental issues, or many other things. Such a story is useless, unless something similar is documented and corroborated. And that is the best??????? If anyone has better information or a large scan of the negative, let me know.